IDENTIFYING FEATURES: small leaved privet has yellow-green leaves up to 7cm long, usually with wavy margins while broad leaved privet has dark green leaves up to 12cm long which always have smooth margins. 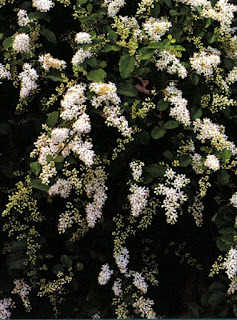 Privet flowers are small and white in large sprays on the ends of or along the branches. FRUIT / SEED: small leaved privet produces very large numbers of black berries about 4-6mm across, while broad leaved privet has slightly larger berries, 5-8mm across. Description: There are two species of privet which are considered weeds in Australia, the broad leaved privet (Ligustrum lucidum) and the small leaved or Chinese privet (Ligustrum sinense). Both varieties originated in China and were imported to Australia via England. Privet thrives in Australia because we lack its natural predators. We also have an ideal climate for all stages of its biology including germination, vegetative growth and fruit and flower production. 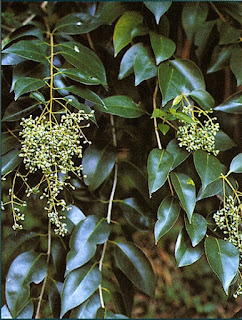 Broad leaved Privet can grow into a small tree to a height of around 6m. It has matt, oval-shaped leaves up to 12cm long which are a deep green in colour, although they are paler on the undersurface. The flowers are in long clusters or panicles which begin as white buds and open to fragrant white flowers in summer. The fruit ripens to purplish-black in winter. Small leaved privet has mildly hairy, oval leaves that are deep green in colour. It is a shrub to small tree up to 3-4m tall. The flowers are small and white and appear in spring. The leaves are opposite and up to 7cm long. There are two major leaf forms for this species. 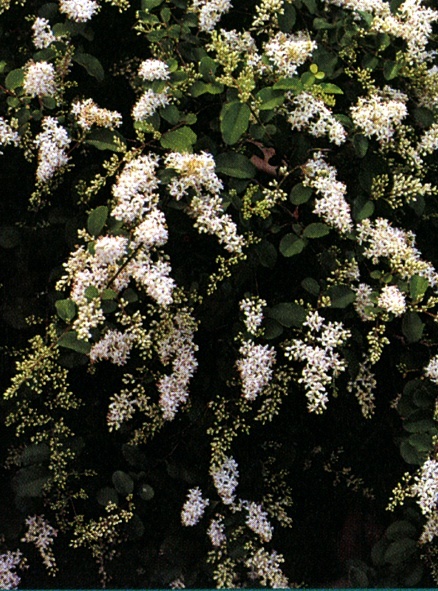 One is similar to broad leaved privet but is generally smaller and has a less drawn-out tip. The other leaf form is smaller with wavy edges and readily distinguished from the broad leaved privet. The blue-black berries are attractive to both native and introduced birds who spread it great distances from the parent plant. It thrives along water courses and drains and once established it chokes out native species. Reproduction: By seed or vegetative means. Broad leaved privet can produce 10,000 to 10,000,000 seeds per tree. These are dispersed widely by currawongs, silver-eyes and eastern rosellas. It will shoot from roots near the soil surface if cut down, and will rapidly regenerate after burning. Small leaved privet is probably even more tenacious as it not only coppices in response to disturbance it also suckers from any root left in the ground, or any live branch left on the ground. Problem: Privet causes hayfever or allergic reactions in sensitive people. Mature trees can produce a million or more fruits in a favourable year. It is well adapted to low light levels and will flourish under dense canopy cover, particularly native pittosporum. The privet seedlings can outnumber the native species by ratios of several hundred to one. When there is an increase in light levels due to disturbance, privet will eliminate native species from the site by exploiting soil nutrients and moisture via its dense root system with greater efficiency than its native competitors. Control: Remove young plants by hand. This is best done when the soil is moist to ensure you do not break off or leave any of the root system in the ground. For plants greater than about 30cm tall, cut the stem close to the ground and immediately apply full strength glyphosate or tree killer. For larger plants (with a stem circumference greater than 8cm) it is better to kill the tree before cutting it down. This can be done by drilling 1cm holes down into the lower bark 4-5cm apart around the trunk. Fill these with a woody weed or tree killer. The tree will defoliate within a month and can then be cut down.